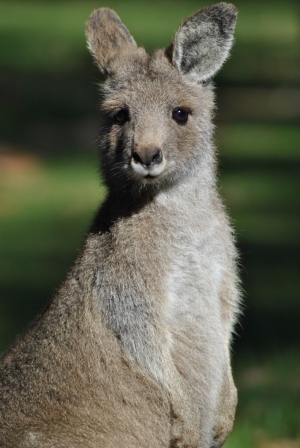 There is a lot of kangaroos in Australia. 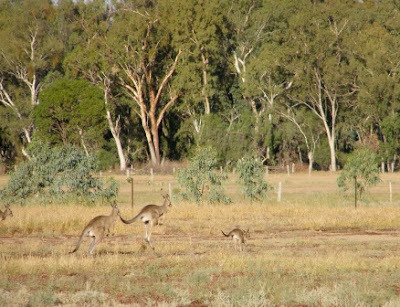 When Charlotte was little, Mum and Dad lived on a 100 acre block and when they went walking in the bushy bits they could see lots of kangaroos. At Penrose Park (monastery) we see heaps of kangaroos just dotted around the place. We have seen kangaroos on our street as well. 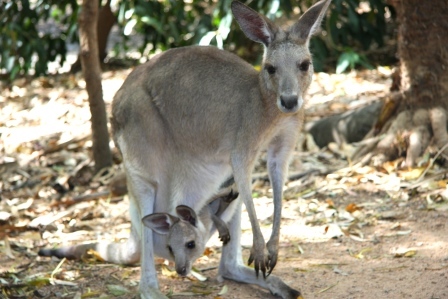 When we were saying morning prayers one day, Mum said, "Look there is a kangaroo." I rushed to the window and there was a kangaroo happily hopping down the road. We also saw a kangaroo when we were going running.We were walking up to the bush track in the early morning. "Look, it's a kangaroo," said Imogen. It sat there in the bush looking at us, then it hurried away as if it was late for something. Dad hit a kangaroo late one night. I think the kangaroo did more damage to the car then the car did to it. Imogen was afraid that the kangaroo would go through the windscreen and it would sit in her lap. Dad managed to get the car home. Luckily for me I was not in the car but I did get to see the car afterwards. It had kangaroo fur on it. Both the kangaroo and the car ended up dying. I like kangaroos and their big legs.